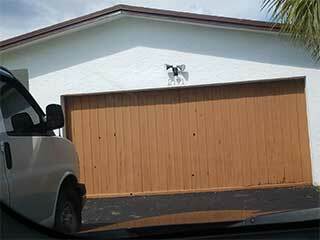 It's important to regularly make sure your automatic garage door is functioning to the best of its abilities. Doing this can help you avoid a lot of different accidents and problems, and make the mechanism last longer as a whole. Our service professionals can perform a wide range of adjustments and test to ensure that your system is operating at peak efficiency. In order for your door to move without shaking and in steady form, the tracks must be straight, correctly aligned, and without any bending or rust. Otherwise, the rollers could get stuck, or the door could get off track. The panels too need to be in pristine condition, so minor dents or cracks are far from welcome. Our team will closely inspect these components, and repair any damage we discover on the spot. Over time, the components that counter balance the weight of the panels and help it move will begin to weaken, at which point you may find that your door is unable to fully open or to stand still halfway closed. To prevent this, or to fix it when it happens, our technicians will adjust the tension of the springs, which will have the added benefit of reducing some of the strain these hardworking parts are under, thus making them last a little longer too. This is a potentially dangerous job, so we urge you not to try and do it yourself, to avoid getting hurt. Your electric opener can be incredibly convenient, but it's important that you make sure that its safety-ensuring features are all functioning correctly every once in a while. During our maintenance visits, we will test the auto-reverse mechanism as well as the photo electric sensors, to be certain that your opener will reverse the door in order to keep it from closing on a person or an object. If you want to save money on costly repairs, and ensure that the investment you made buying this system pays off in the long run, then contact Garage Door Repair Yonkers, NY today and schedule a maintenance appointment. Our experts will make sure every part of your system is in great functional shape.